Simplicity is my theme this week, because sometimes that is all there is time for and exactly what is needed. Shortly before my sister and her husband arrived for a brief overnight visit Saturday I dashed out to the garden to collect a few flowers to display throughout the house. Instinctively I headed toward the Penstemon digitalis ‘Husker Red’ (Beardtongue), the current star of the meditation circle and quickly gathered an armful of blossoms. Inside I removed most leaves, gathered the stems and trimmed the ends. I inserted the entire bunch en masse into a favorite ceramic vase decorated with earth toned matte glazes. The effect was simple, fresh and airy. Penstemon digitalis ‘Husker Red’ is a perennial and is drought tolerant, two reasons it was chosen to provide part of the labyrinth walls. It is also evergreen in my 7B planting zone. Its name may be confusing as its tubular flowers are white; however many (not all) of its lance-shaped leaves tend toward dark red, lance-shaped leaves and it has rich burgundy stems. Actually some of the flowers also do carry a slight pink tinge. Husker Red self-seeds easily and I was able to share a lot of small volunteers and a couple of good sized plants with my brother-in-law for a new sunny border he is planning. Although this arrangement was assembled on Saturday, it still looks fresh on Monday. 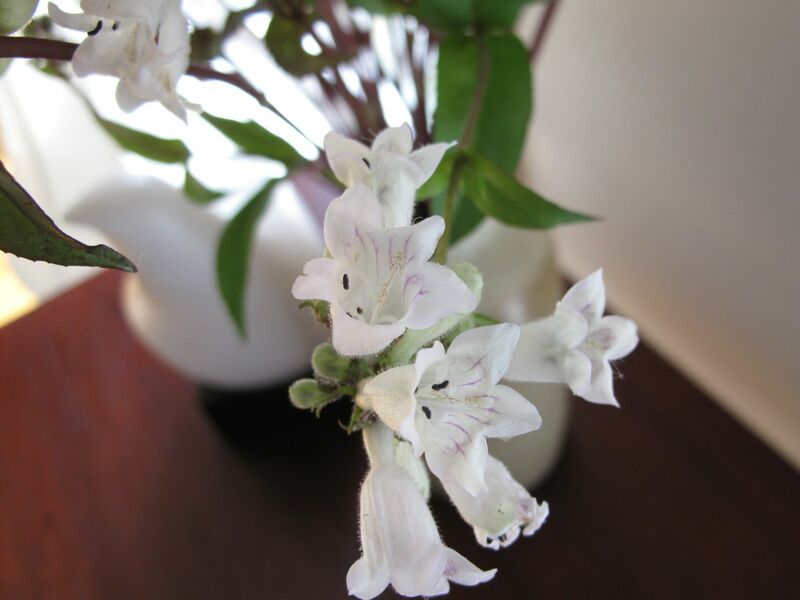 This versatile penstemon lasts quite well indoors as a cut flower and outdoors, it continues to bloom profusely. This entry was posted in garden and tagged flower arranging, flower design, in a vase on monday, nature photography, Penstemon digitalis 'Husker Red' (Beardtongue) on May 26, 2014 by pbmgarden. I love simplicity I will look for seeds for this myself as I think it would do well here with a little irrigation. 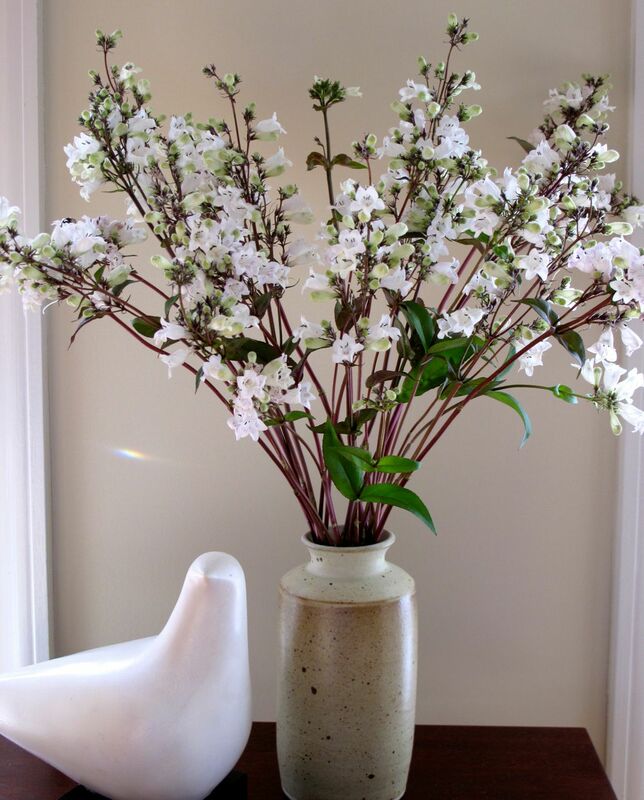 The vase you have chosen this week is perfect with these simple flowers. I think Husker’s Red would do well for you. 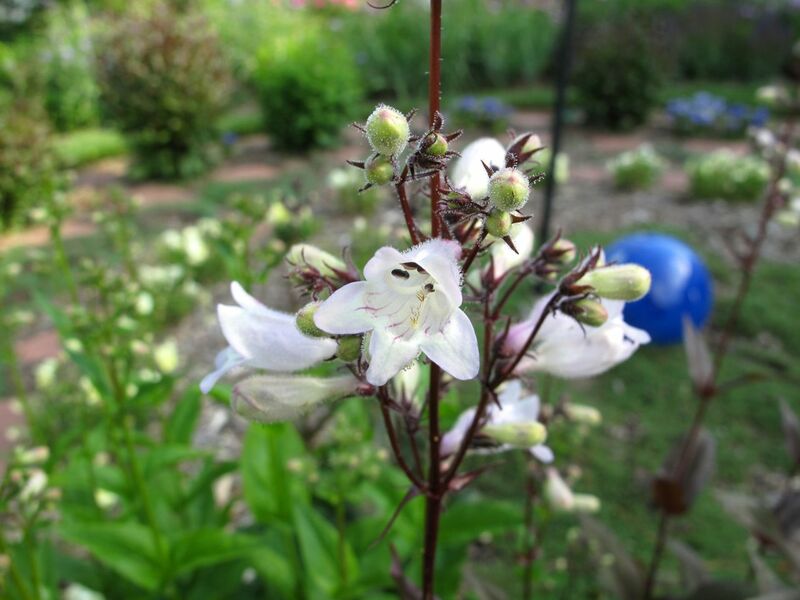 There are a lot of other penstemon to try as well in many colors–it’s a prairie plant, so hot and dry should be ok. So lovely. You are right, sometimes simple is best. Thanks Marian. I was happy with how uncomplicated it was to put together. That does it, I’m off to buy this plant for all the fabulous reasons you mention. Lovely in your Monday vase, but in the garden, a real show off. I think you’d like it Stepheny. If you’re coming this way let me know and I can share some with you. That is a gorgeous plant Susie – and restricting the vase to a single variety is a timely reminder that we don’t need to go mad with the choice available. Perhaps it is hard to be disciplined but I shall definitely go for a simple vase next week, just to remind myself that that is all it need take 😉 Thanks for sharing your penstemon with us. Really lovely, I love a vase of en masse flowers. I feel I have really overlooked this plant too, mainly because of its name, its one I should like to grow on my sandy soil as its very pretty. Thank you Julie. I’ve been pleased with it and hope you will be if you try it. Is it “Beardtongue” that is off-putting or “Penstemon”? ‘Husker Red’ was off putting, I thought without looking properly that meant red flowers. Its really very pretty and the stem colour is wonderful. The flowers look so graceful in the vase, maybe even more so than in the garden. I wonder if it’s because the foliage is off? Very nice! I had no idea you could use penstemon as a cut flower. We have lots of Husker Red and also the straight species. They haven’t started blooming yet, but when they do we will bring some into the house. 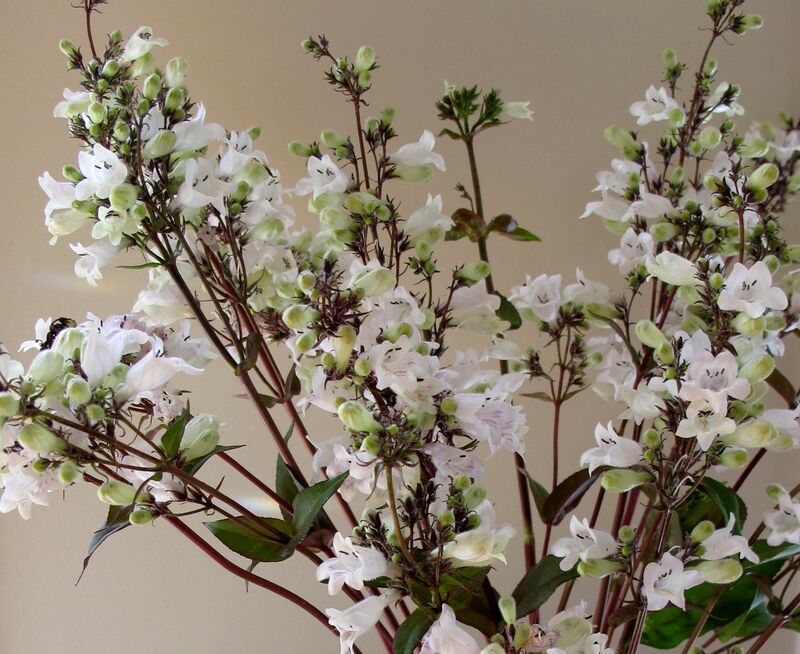 I love this penstemon and your arrangement looks delightful. I have one plant of this and so far it hasn’ t self seeded so I haven’ t enough to copy your arrangement. I’ m going to take some cuttings; penstemons are easy from cuttings, so that perhaps next year I will have enough to pick. Thanks for the idea. I love the simplicity for this arrangement, Susie – it’s the opposite of my own jumbled arrangement, this week, into which I think crammed too much at the cost of the appreciation of individual flowers. ‘Husker Red’ didn’t perform well for me in zone 10b but maybe I’ll try it again. They’re delightful indeed and how wonderful to have so many that you can actually cut them for the vase. I tried them one year in my mountain garden but they didn’t come back. Might have to give it another go. Thanks Annette. I hope you’ll have good luck if you do try them again. I have seen some other lovely colors for penstemon so think I’ll try some different ones. 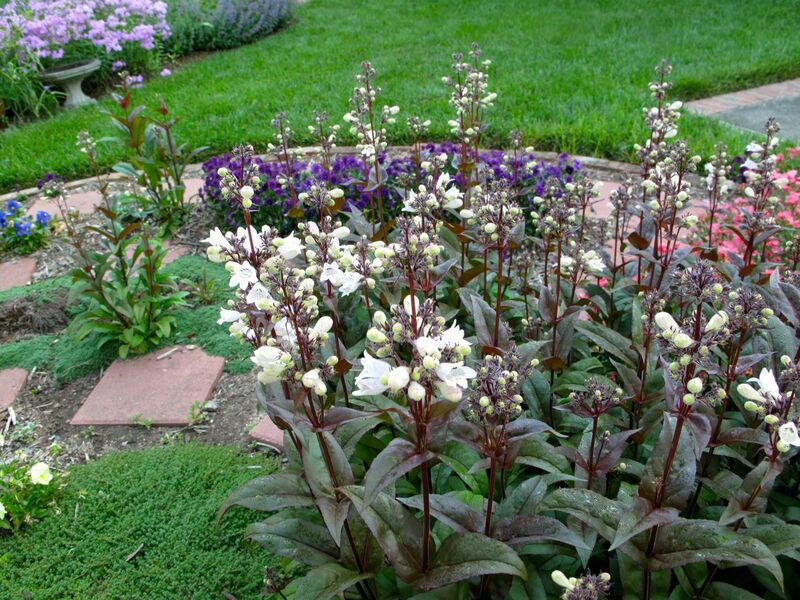 I had one I really loved but most of it died: Penstemon x mexicale ‘Pikes Peak Purple’. Oh that’s lovely. Thank you for the reminder about Husker’s Red, I shall add it to my next seed order.